What the hell, right? 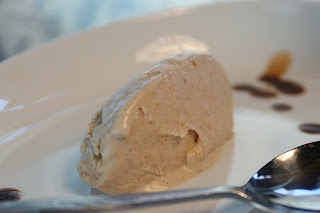 Oatmeal Ice Cream? It's almost hard to even imagine what this would taste like, but let me assure ... it ... is ... phenomenal! With an entire half gallon of fresh Oberweis cream on my hands, I went into ice cream making mode. German Chocolate with Caramel Pecan Swirl, Mexican Fried Ice Cream Pie, and Lemon Jalapeno all churned out of my kitchen (look for the postings of each soon!). There was enough cream left for one more batch but my creative mind blanked stagnant. A search reminiscent of a Saint Bernard (complete with a small whiskey barrel collar) looking for a lost avalanche victim started in my kitchen - not a cupboard was overlooked for a clue to a new ice cream flavor. Saltine cracker ice cream? No. Green chili ice cream...maybe, but not today. Oatmeal? Oatmeal ice cream. Could it work? Should it work? Why not? So oatmeal ice cream it was and I can't be more excited about it. I couldn't decided whether to leave the oats in the ice cream or to strain it out so tried it both ways. The strained oatmeal was smooth and creamy, refined and upscale; while the unstrained oatmeal was creamy and thick yet chewy, outrageous and fun. Both ways are so fat and happy amazing that you can't delay making this ice cream today! Tips and Techniques: This ice cream is great straight up; but for fun, try a little drizzle of maple syrup and a few fresh blue berries. Or if you are adventurous, reduce a little balsamic vinegar and drizzle just a smattering on the plate. It's an odd, almost stuffy combination that I liked, Dave preferred the maple syrup. Heat cream, remove from heat and whisk in brown sugar, salt and oats. Steep for 10 minutes. Whisk the egg with 1/4 cup white sugar until fluffy, pale and doubled in size. Place the steeping cream back on the heat and temper in the egg. Cook to a custard, remove from heat and add the rum and cinnamon. Place the custard in an ice bath to chill it, then refrigerate overnight. Decide if you want to strain it, or strain half and try it both ways. Process according to the ice cream manufacturers directions. Fresh ice cream should be eaten within a week. Like it or not, hard boiled egg season is upon us. Though short, this season is best known for bright and colorful eggs, happy screaming munchkins and overflowing buckets of smelly, green rimmed eggs. My goal is to put an end to this season. Well, pink and yellow painted eggs - okay, I'll deal. Crazed kids - sure, once a year is fine. But the over-boiled, rubbery, stinky egg has got to stop! Below I've detail out exactly how to avoid this tragedy ... cue the chirping birds and singing angels. Ok, now you have beautiful, edible hard boiled eggs - what do you do with them? Classic deviled eggs are back in style (did they really ever go out of style??) and I Fat 'n Happy them up with pesto, wasabi powder and bacon and blue cheese. Rejoice at this Fat and Happy 'eggxcellent' egg season, it will be gone faster than the candy coated malted milk balls you hide in your sock drawer. Tips and Techniques: These are loose recipes, taste and adjust according to your own preference. For a creamier filling use a food processor to mix the yolk fillings. I wanted a more rustic feel with a little texture so I mixed mine with fork; for the the pesto I used the mortar and pestle to keep a it little on the chunky side too. How to cook the most perfect hard boiled eggs and then what to do with them after. 7. Peel your gorgeous eggs and proceed below. Cut the eggs in half lengthwise. Mix together the yolks, bacon, cheese, mustard and yogurt. Drizzle in a little oil or water to reach desired consistency and add in fresh black pepper. Taste test; add more or less cheese and bacon based on your preference. 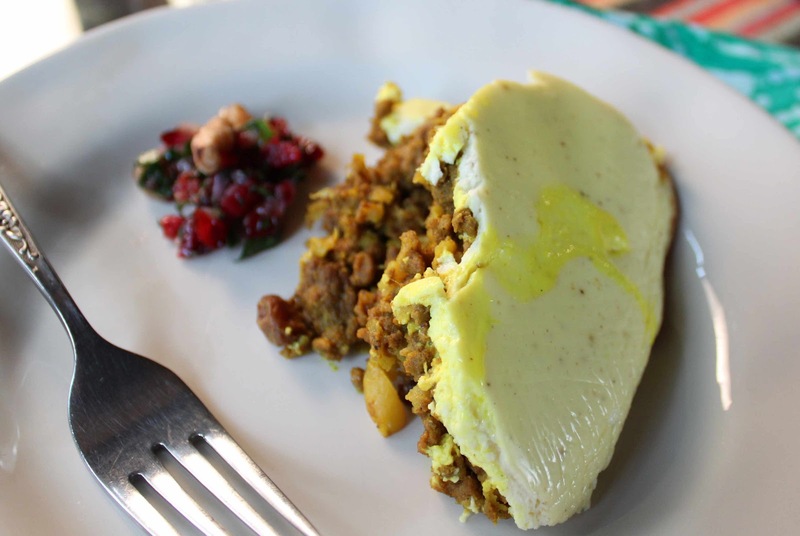 Fill the whites with the bacon blue yolk mixture, top with a tiny crumble of blue cheese and a small bacon crumble. 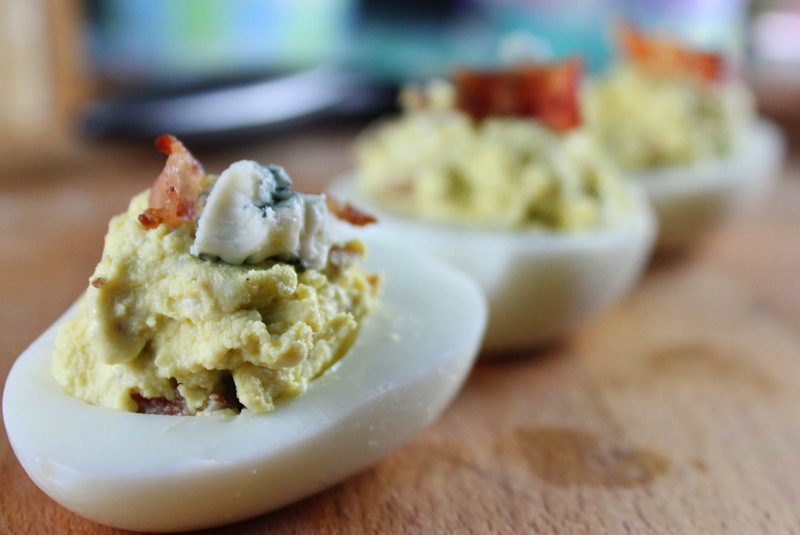 Enjoy the Bacon Blue Cheese Deviled Eggs! Cut the hard boiled eggs in half. Mix the yolks with the wasabi powder, soy sauce, sesame oil and yogurt; drizzle in water until desired consistency is reached. Taste this, you may want a bit more powder for more heat or more soy sauce for a saltier flavor- Use my measurements as a guide. Fill the whites with the yolk mixture and top with thinly sliced green onions; enjoy your wasabi deviled eggs! These tasty devilish eggs get a kick from basil pesto. Either make a basil pesto or purchase one for ease. This is just quick version, I used what I had in the house; almonds instead of pine nuts and a little mascarpone for creaminess. Have fun with it! Make the pesto first. Either in a mortar and pestle or in a small food processor blend the nuts, cheese, basil, mascapone and garlic while drizzling in the olive oil. Season with a bit of salt and pepper as needed. Cut the eggs in half lengthwise, place the yolks in a bowl. Mix in the pesto and a few drizzles of water or olive oil until the yolk mixture reaches desired consistency. Fill the whites with the pesto yolk mixture, garnish with a few slivers of toasted nuts and Parmesan cheese. Enjoy the basil pesto deviled eggs! German Chocolate cake says birthday to me. The tall- tiered cake, dripping in caramel frosting with coconut and pecans, crowned with colorful flickering candles on top... Oh happy day! Ice cream making mode was on thanks to fresh cream from Oberweis Dairy when the image of this German Chocolate cake came to mind. Why not turn that childhood memory into a super yummy frozen treat? 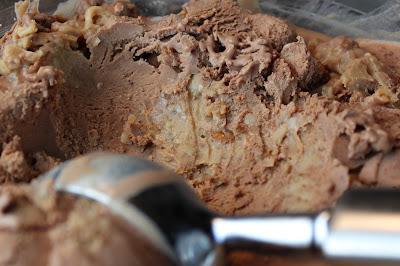 I set out to make a German Chocolate ice cream rather than a basic ice cream with cake mixed in; the result is super creamy and chocolaty delicious. What really brings the full cake flavor together is the layer of caramel coconut pecan swirl. It's basically frosting for your ice cream, but it stays creamy when frozen. I couldn't resist adding a candle to the ice cream scoop; this is now embedded in my memory in place of that tiered cake. Kids of all ages will love this Fat and Happy rendition of a birthday classic. Tips and techniques: I felt like I made just a bit too much frosting swirl and did not layer the entire batch with the ice cream; it just depends on your taste preference. Using all of the swirl will just give a little sweeter ice cream. Heat the cream, half and half and 1/4 cup sugar over medium heat, just below boiling. While the cream is heating, whip the egg yolks with the remaining 1/4 cup sugar until they are pale, creamy and doubled in size. Temper the eggs with the hot cream by adding in just a drizzle of the cream to the eggs at a time. This will keep the eggs from cooking or scrambling. Pour the egg mixture back into the pan and return to medium low heat. Whisk in the cocoa powder and vanilla and continue to cook until the custard thickens. Stir often with a wooden spoon, check the thickness of the custard by running your finger along the back side of the spoon. If the custard is thickened, your finger line will stay. Remove the custard from the heat and stir in the melted German chocolate and a pinch of salt. Place the custard in an ice bath to cool. Cover and place the custard in the refrigerator overnight to steep. Before placing in the ice cream maker, stir in the Greek yogurt. Process according to the ice cream makers directions. Make the Coconut Pecan Caramel Swirl ahead of time so it has time to cool before the ice cream comes out of the ice cream maker, this can be done the night before and kept in the fridge. To add in the coconut pecan caramel swirl, the best method is to layer it with the ice cream rather than to swirl it in the ice cream maker. Do layer this when the ice cream comes out of the ice cream maker so it is still a little soft and pliable. Choose the container that will hold the ice cream, add a layer of ice cream and then a thinner layer of the German chocolate frosting. Repeat until you have used up all the ice cream and swirl. . Place in the freezer until solid. Place the butter, evaporated milk and brown sugar in a small sauce pan. Bring to a soft boil and hold there for about 5 minutes, stirring often. Add in the vanilla and pinch of salt. Remove from heat and stir in the coconut and pecans. 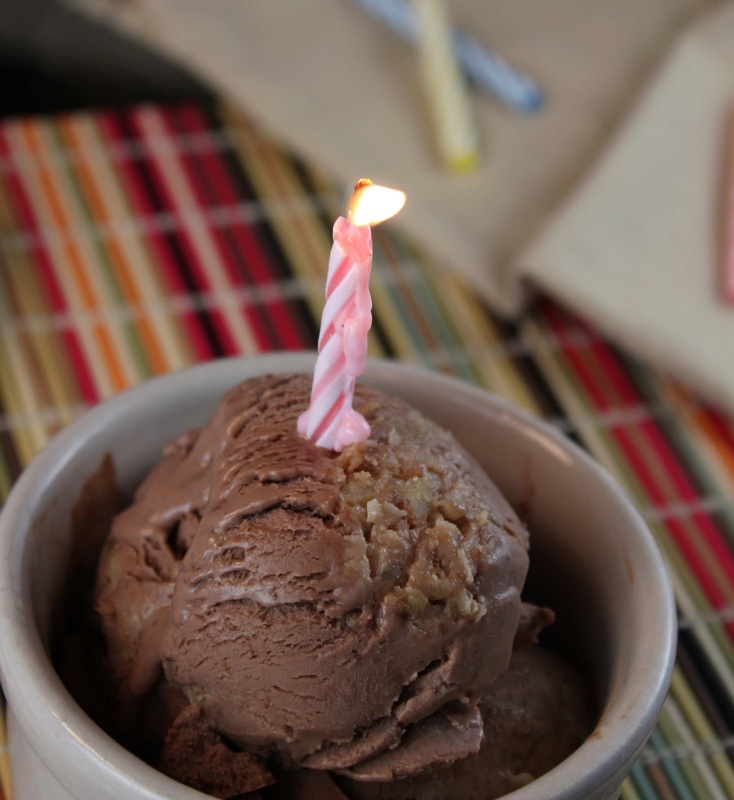 Cool, follow the directions above to layer with the German Chocolate Ice Cream. Are you buying organic, fair trade, shade grown coffee? These toxin free, habitat preserving and safe working condition brews are all to rage for good reason. Sure you'll pay more for these beans but isn't it time we all pay a little more attention to how our basic purchases affect the world? Getting off my little soap box now - what else can you do with coffee beyond just drinking it? Coffee is an easy addition to desserts but what about using it to prepare dinner? 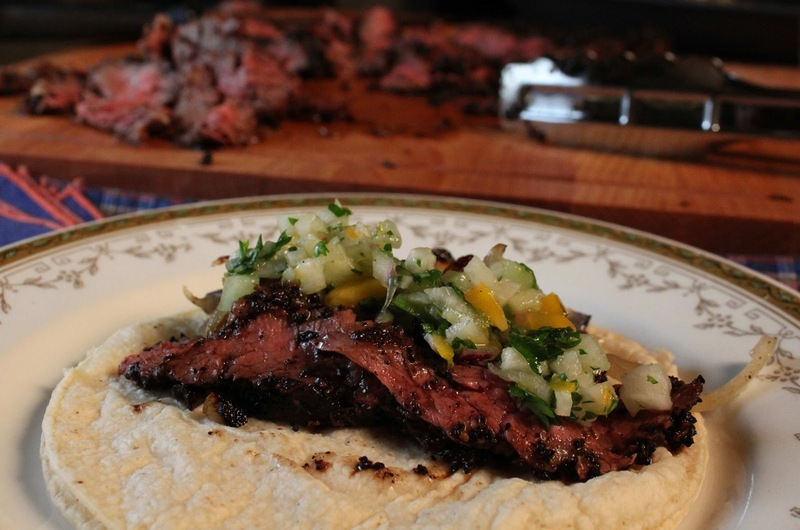 If you think of the bean as a spice, it will open up a myriad of ideas. My goal was to use coffee in a nontraditional, yet traditional sense. Enter the traditional fajita, soak it in orange juice and coffee, then crust it in ground coffee and peppercorns and top with a spicy sweet salsa. Ya, it's pretty good. Let's talk about the big question - will the caffeine keep you up? I think it's minimal, if any affect. Dave and I both slept as normal and he doesn't even drink coffee. The more a coffee bean is roasted, the less caffeine it will have (i.e. darker roasts have less caffeine than lighter roasts) so I'll go out on a limb and say that cooking it more may dilute the caffeine content further. Please note the FDA has not approved that statement. Pick up a bag of coffee (preferably one that protects the environment and the workers) and put a little fat and happy zing in your fajita night. Tips and Techniques: Nervous about the full coffee crust? Start with the marinade and only cover half of the steak with the ground coffee mixture. Let your taste buds duke it out. The image on the left is the skirt steak with just the marinade (the orange and coffee make a lovely combination) and the image on the right has the crust (bold, almost crunchy and packing a spicy coffee punch). I quite enjoyed the coffee crust as did Dave but it was fun to try it both ways. Place all the ingredients in a large plastic bag or shallow seal-able tupperware dish. Add the meat, shake well to distribute, set aside until ready to grill. Marinate the meat at least 30 minutes, up to 1 day. Be sure to bring the meat to room temperature before grilling. While the meat is marinating, chop up the veggies. Combine them all into a dish with the red wine, olive oil, lime juice and salt, toss to combine. Set aside. Slice the onions and place on a fajita pan or in a large piece of tin foil. Drizzle with the olive oil, pepper and salt, toss and grill by either placing the fajita pan directly on the grill or tightly wrapping the tin foil together and placing that on the grill. Remove when the onions are nicely caramelized. In a coffee grinder or using a mortar and pestle, grind the coffee beans and peppercorns together, grind this relatively fine. Pour onto a large, shallow plate. 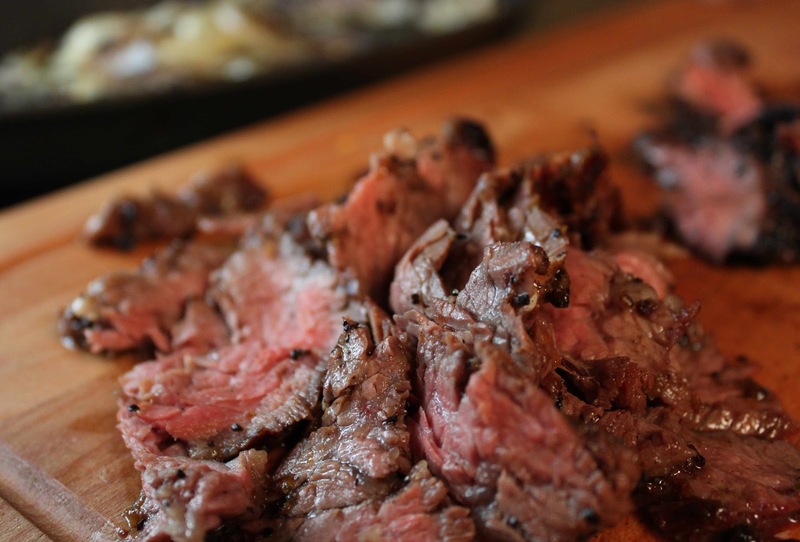 Remove the steak from the marinade and drag through the coffee grounds on both sides. Wrap the tortillas in tin foil and place on the top grill basket to gently warm. Grill the room temperature steak over medium high heat for about 2-4 minutes per side (depending on the thickness of your steak), it's better to under cook than over cook. The high heat will sear in the juices with the coffee crust. Remove from heat and let rest for at least 10 minutes. The skirt steak will be the most tender if you slice the steak across the grain at a very sharp angle, in thin strips. 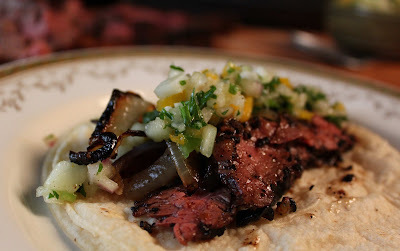 Layer each tortilla with thin slices of the grilled skirt steak, caramelized onions and a scoop of the jalapeno honeydew salsa. Serve with a wedge of orange and enjoy. I'm not sure how it happened but shortbread is one of my favorite treats, ever! And why not - when done right it's buttery, flaky, melt in your mouth deliciousness. 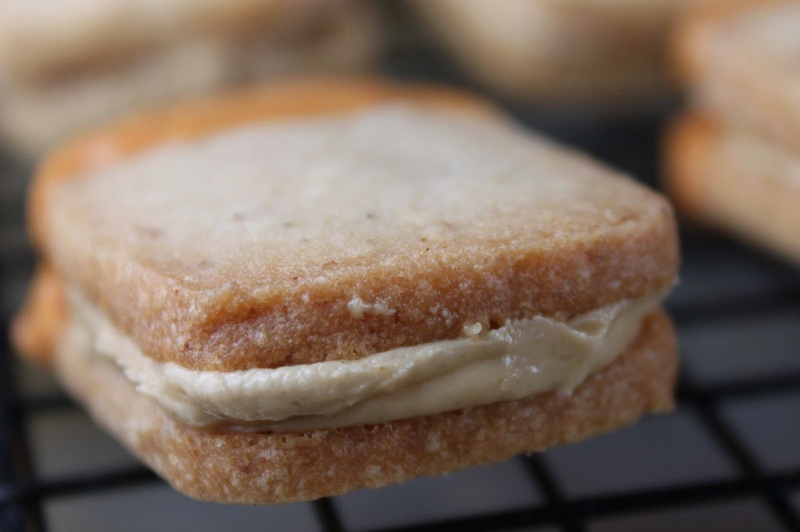 Plus, I love that shortbread can be 'dressed up' or 'dressed down' depending on the occasion; and just simple herb or nut swaps change the flavor with ease. Today's shortbread cookies tout a lovely toasted pecan flavor which is not to be outdone by the soft, creamy, fluffy caramel filling. As if that isn't enough, each scrumptious sandwich is dipped into a lovely butterscotch, milk, dark or white chocolate - oh yum. When you need a treat that will wow, these Pecan Caramel Shortbread Cookies will satisfy beyond belief. 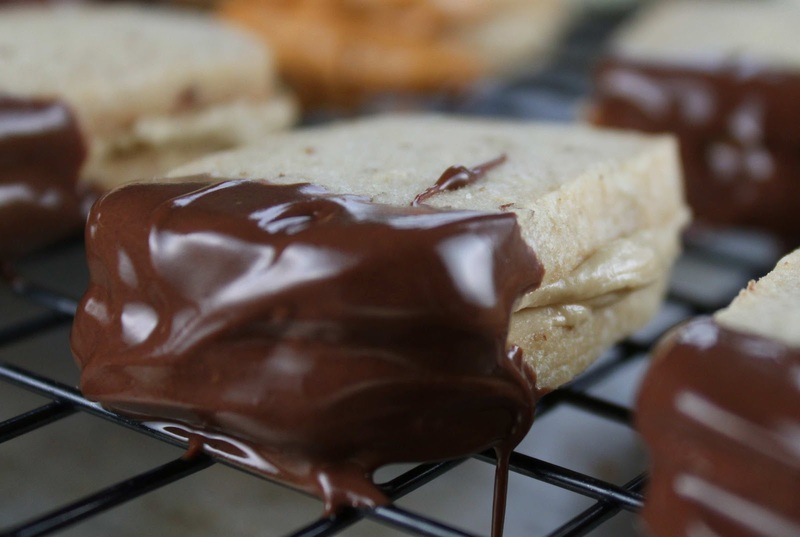 Take your shortbread to the next level with this Fat and Happy caramel filled cookie. Tips and techniques: Make these gorgeous sandwich cookies small; the caramel filling and dipped chocolate with two layers of cookies is a lot to eat so the smaller the better. You can always eat two! Pulse the powder sugar, salt and pecans lightly in a Cuisinart. Add in the butter, vanilla and flour, continue to pulse just until the dough comes together. Wrap the dough in plastic wrap, shape as desired and place in the refrigerator for at least 1 hour. Preheat the oven to 375 degrees. 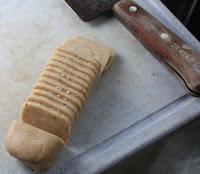 Remove the shortbread batter from the fridge and carefully slice into thin cookies and lay on a lightly greased cookie sheet. Try a test batch first of one or two to see how thin you prefer your cookies, this will help you test the timing needed as well. My cookies took about 8-12 minutes, they should be just golden brown on the underside. Allow the cookies to cool slightly on the cookie sheet before moving them to a cookie rack. Once all the cookies are cooled and the caramel is whipped, melt the dipping chocolate; do this slowly over a double broiler. You can melt the chocolate in the microwave, but be very careful not to burn the chocolate. Only place in the microwave for 10 seconds at time and stir often. Smooth 1-2 tablespoons of caramel filling between two cookies, this will depend on how big your cookie is. Set aside until all cookies are filled. Carefully dip one end of the filled cookie into the melted chocolate and shake off the extra. Set the cookie on parchment paper until the chocolate hardens. Melt the butter over medium heat, add in the brown sugar and bring to a rolling boil. Stir as needed. Carefully pour in the heavy whipping cream and whisk quickly. Allow the caramel to boil for about 5 minutes. Remove from heat and cool. Once the caramel has cooled, use a hand beater to whip the caramel until fluffy. Fill the cookies as directed in the recipe above. Breakfast doesn't have to be boring, even if it contains just eggs and sausage. The key is to find a way to elevate it, spice it up and bring it all together. In this breakfast tostada, a red pepper coulis (sauce) does just that. Eggs are scrambled simply with onions and garlic which sit on top of sliced sausages with a crispy tortilla on the bottom. All great stuff - but by turning the red peppers into a sauce instead of chopping them and adding to the scrambled eggs, this dish is elevated to restaurant quality. Change up your breakfast by creating a super easy sauce that will make you feel like you should be paying yourself for it. I suggest taking it outside with a mango mimosa for a full fat and happy brunch effect. Tips and techniques: Consider this a loose recipe, the type of tortilla, sausage and cheese are really up to you. And by changing each one of those items you can drastically vary the outcome. Cook sausage in a skillet pan and set aside. In the meantime, make the red pepper sauce, recipe below. In the sausage pan add in the onions and saute; add in a pat of butter if needed. Place the tortillas on a sheet pan and place in the hot oven to begin to crisp. Add in the minced garlic when the onions are softened, continue to cook for a few more minutes. Slice the sausages, divide them in half and place on the warming tortillas. Sprinkle the sausages with the shredded cheese and place back in the hot oven. In the meantime, whisk the eggs with a tablespoon of water and a pinch of salt and pepper. Pour the whisked eggs in with the onions and garlic, move the eggs often with a soft spatula. Keep the eggs a little moist rather than overcooking and drying them out. Toss in the fresh oregano with the eggs. If the red pepper isn't roasted, place it over the open flames of your stove top or under a broiler until the skin turns black. Remove the skin. Chop the roasted red pepper into small pieces, place in a small saute pan. Add in the minced garlic, a drizzle of olive oil and the water or broth. Cook over medium heat to fully soften the pepper, about 5 minutes. Pour into a blender with a good pinch of salt and black pepper, blender on high until the sauce is smooth. If the sauce is too thick, add a few drizzles of water until desired consistency is reached. When this months Recipe Swap recipe came through for a wacky cake, I thought how fun, and what easy cleanup. A wacky cake is one of a group of cakes that were popular in the depression era; popular thanks to their ease and accessibility to cheap ingredients. Containing no eggs or butter, they are stirred together in the same pan as cooked in. The recipe swap rules state you must change at least 3 ingredients and/or the cooking method; essentially make it your own. Initially I set out to keep true to the depression ease and simplistic-ness of the original recipe and ingredients, but somehow Grand Marnier fell into my cake and it just went from there. Instead of using cocoa as the base, this was my first opportunity to use one of my new Strange Ingredients a friend sent in, vanilla powder. To keep the calories down, I opted for applesauce in place of the oil, for that reason, the texture of this cake is reminiscent of a quick bread. 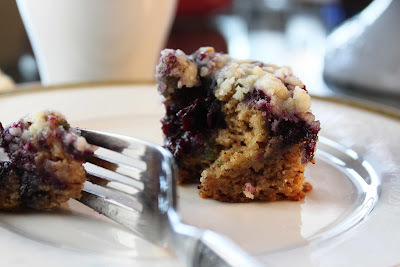 When you get a good forkful of the cake, a blueberry and the crumb topping, it makes for one good fat and happy bite. Tips and Techniques: Switch up the flavor of this cake with ease by changing the fruit filling. Try Strawberries, peaches or apples! If you don't have vanilla powder, either add an extra tablespoon of the Grand Marnier or add a teaspoon of liquid vanilla extract. Make the blueberry filling first. Combine all ingredients in a small sauce pan, cook over medium heat for about 10 minutes. Remove from heat and set aside until ready to use. This step can be done a day or two ahead of time. Place all the ingredients on a plate, use a fork to mash the dry ingredients into the butter. Once it is all combined, set aside until ready to use. Have the blueberry filling and the crumb topping ready. Once you add the vinegar to this cake, you need to work quickly. Preheat oven to 350 degrees. Have the one cup of water ready. In a greased 8 1/2 x 8 1/2 baking dish, sift in all the dry ingredients and stir with a fork. Make 3 holes in the flour and place the Grand Marnier in one hole and the applesauce in the second. Quickly add the vinegar to the third and then pour in the water while stirring everything together with a fork. 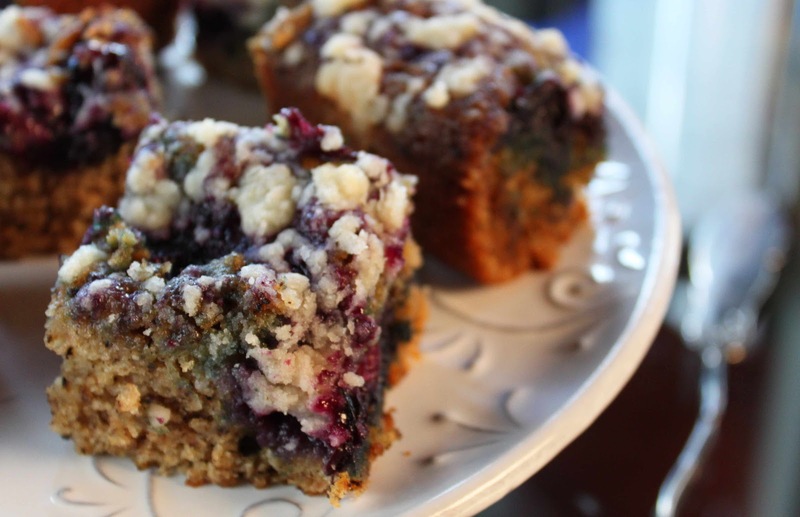 Spoon the blueberry filling over the top of the cake, and then crumble the butter crumb topping on top of the filling. Place in the oven until a toothpick comes out just about clean, the crumb topping will not brown so don't look to that as an identifier. My cake took around 40 minutes or so but keep an eye on it - it's better to under cook this than over cook. Remove from the oven and cool slightly. If serving this warm, a scoop of ice cream or a dollop of whipping cream would be a fantastic addition. Mari lives in Oregon wine country and is a budding wine connoisseur. I fell in love with her use of Pinot Gris in the glaze for her (gluten-free!) Lemon Cake swap, which was her inaugural recipe with us. Visit her at The Unexpected Harvest. Monique has been food blogging since 2007, and was very gracious as I talked to her about my personal project of the recipe swap while on a professional work call with her. It must have gone okay, because she joined in, and her first recipe was a BLT-inspired chicken pot pie. I'm so glad to have her on board. Shari is our first International participant! Writing from down under, we cherish her voice in the swap because she brings the results of additional recipe challenges; the seasons are flipped from where most of us are blogging. 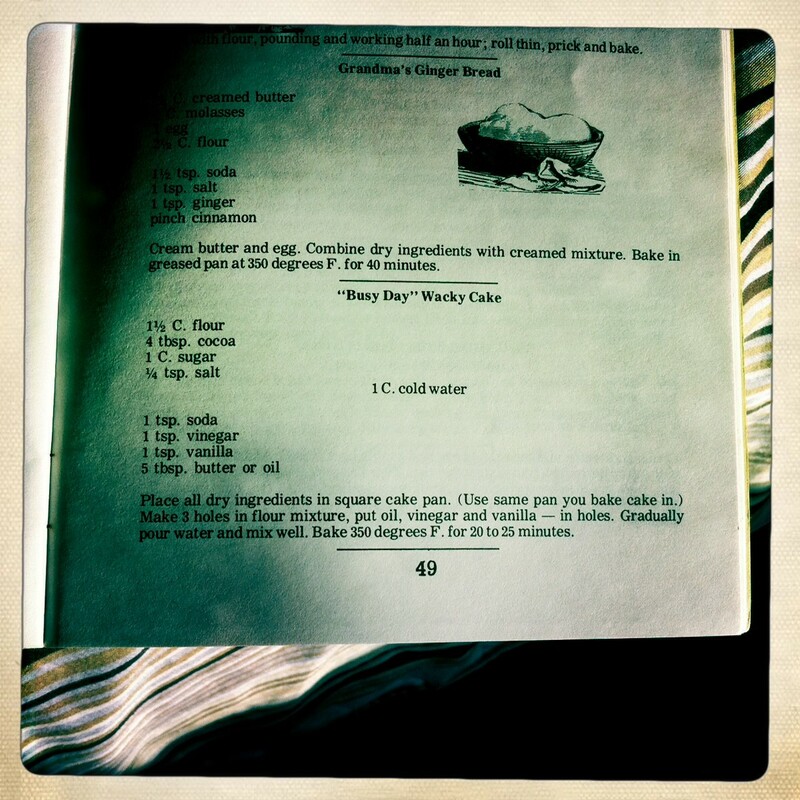 Her first swap was Grandma's Chicken Pie and Drop Biscuits, which she made in the dead of summer. Jennifer's tag line says it all: Life is too short to eat bad food. At her blog, Adventuresome Kitchen, you will find a passionate food-type, feeding her family amazing meals and living to blog about it. Jennifer joined in at Grandma's Chicken Pie and Drop Biscuits. The Cake Duchess. 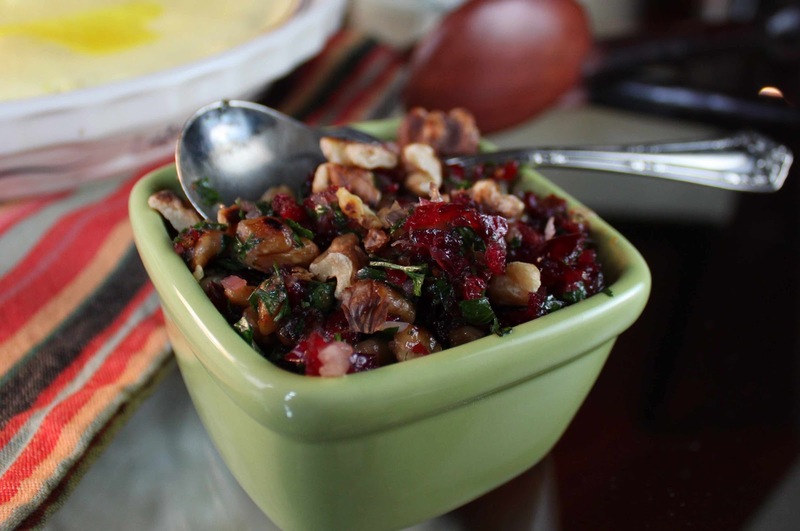 The name says it all, and Lora's recipes are rock solid, creative, decadent, inspiring. What other adjectives can I throw at her? 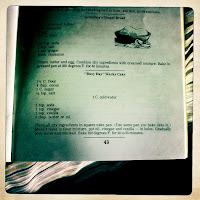 Her innaugural recipe was Grandma's Chicken Pie and Drop Biscuits, a rare savory recipe for her to develop. Mary is a lifelong resident of the San Francisco Peninsula and was diagnosed with Celiac Disease in 2007. Her search fora gluten-free chocolate chip cooke that didn't taste, look or feel gluten-free inspired her blog and she's been happily baking ever since. Crissy and Lauren are two recent college graduates who are embracing their passion for all things culinary in the smallest yellow kitchen that ever was. Their balanced diet of equal parts savory and sweet helps them add a little zest to what they do best! Nay blogs about food at Spicy Living from Portland, Oregon, and joined in on the Lemon Cake swap. She incorporated lavender and lemon into cupcakes with cream cheese frosting. Cindy, co-worker, food lover, all-around awesome person. I may have guilted her into the swap, and then I found out her knowledge about US restaurants is almost encyclopedic so I know she's game. Check out her quirky and fun blog. Sabrina Modelle blogs at The Tomato Tart from the San Francisco bay area, and for her first swap (the Lemon Cake) she made a Brown Sugar Lemon Rosemary Cake with Rosemary Caramel. How's that for inspiration?